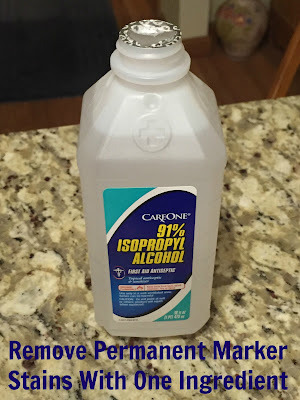 Balancing On My Toes: Household Tips and Tricks: Removing Permanent Marker From Clothes! Household Tips and Tricks: Removing Permanent Marker From Clothes! Living with a boy you learn something new every day! Earlier this week I received a text message while at work asking me if I knew how to remove permanent marker from clothes because someones favorite shirt was in danger of being ruined. So after work I looked up some household remedies for removing marker and thought I would give it a try. There were two stains total but I only took pictures of one for this process. While we were at the grocery store that evening I grabbed some rubbing alcohol. It was the only product I needed to get out the stain! Before I started I laid a couple paper towels inside the shirt so the stain wouldn't spread to the other side. Then started dabbing away. Don't rub the stain, it will only make it worse just keep pressing and pulling away. The paper towels keep the stain from spreading and you can see a few parts of the paper towel that have a pink tint to them. That's how I managed to get permanent marker out of Tim's shirt in less then five minutes! Easy peasey!